See pictures and videos classmates have posted from our 40th Reunion!!! Closed group so ask to join and we will get you in!! 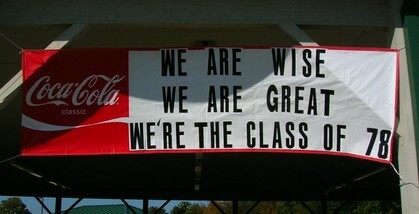 Welcome to the Pulaski County High School Class Of 1978 web site. Come back often to see what everyone is up to and who has recently joined the site. Classmates, please join this site, it's free!! Just click on "Classmate Profiles", click on your name and setup your profile. It only takes a minute! If your name is not listed, click on the "contact us" link and we'll get you on there. YOU MUST LOGIN TO SEE IMPORTANT REUNION INFO. Our mailing list is generated from this site so please keep your address info up to date so you won't miss invitations to our next reunion! Your active participation on the site will help keep it interesting for all of us. Don’t forget to keep your profile up to date and post some new pictures every now and then. Use the Message Forum to give “shout out’s”, share news, or just to say “Hello”. I also want to thank everyone who has left comments for our fallen classmates. Please continue to pay tribute to them by sharing a memory, no matter how small. I would like to encourage everyone to keep spreading the word about this site with our classmates who have yet to sign up.